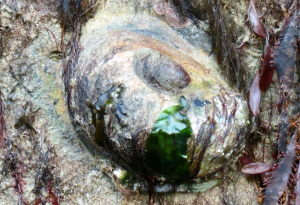 Observation - Slipper Limpet - UK and Ireland. Description: Annual emptying of Thanet's largest tidal pool (at low tide end would be 5m) Found in eulittoral, submerged probably some of the time here, when the sluice gates are shut. Second pic with finger in the way shows how big this C.fornicata is. Annual emptying of Thanet's largest tidal pool (at low tide end would be 5m) Found in eulittoral, submerged probably some of the time here, when the sluice gates are shut. Second pic with finger in the way shows how big this C.fornicata is.